The upcoming Southkey Megamall in Johor Baru is expected to be injected into newly public-listed IGB Real Estate Investment Trust (IGB REIT). The Mid Valley City-type mixed development is a joint venture between IGB REIT's sponsor, IGB Corporation Bhd and Selia Pantai Sdn Bhd. The project is expected to be completed in the next five years with a tentative gross development value of between RM6 billion and RM8 billion. "IGB Corp has yet to receive approvals from the local authorities in Johor, but they have been very supportive of the project. If everything goes as planned, work on the new mall should start in the first half of next year," said IGB REIT chief executive Antony P. Barragry after its listing ceremony yesterday. Barragry said after the Southkey Megamall is completed, IGB Corp will operate the business for some time before putting it into the REIT. "The project will be greater than Mid Valley City as the potential brought through the rapid development of Iskandar Malaysia is enormous," he said. IGB REIT made its debut on the Main Market of Bursa Malaysia yesterday with some 1.92 million shares traded at an opening price of RM1.37, a premium of 12 sen over its offer price of RM1.25. IGB REIT raised about RM780 million, making it the country's fourth-largest flotation this year, behind palm oil firm Felda Global Ventures Holdings in June, IHH Healthcare in July, and pay-TV company Astro Malaysia Holdings which is due to list in October. Barragry said the listing of IGB REIT will provide investors exposure to a highly attractive initial portfolio, comprising two connected super-regional malls, Mid Valley and the Gardens Mall. "We are committed to enhancing unitholders' return and value through the organic growth of our existing portfolio as well as potential acquisition of additional suitable retail properties," he said. KUALA LUMPUR: IGB Real Estate Investment Trust (REIT) expects the upcoming Southkey Megamall project that is being developed by IGB Corp in Johor Baru to be injected into its portfolio by as early as 2015. IGB REIT Management Sdn Bhd chief executive officer Antony Barragry said the inclusion of the property would hinge on how quickly IGB Corp could develop the mall. “We are still waiting for the approval from the state authority before building can commence. “Realistically, we're looking at late 2015,” he said at a press conference after IGB REIT's listing on the Main Market of Bursa Malaysia yesterday. 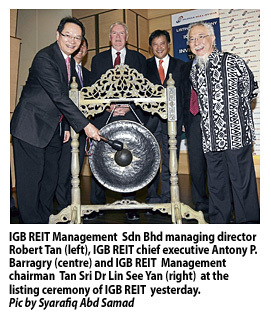 IGB REIT opened at RM1.37, which was 12 sen above its offer price of RM1.25. It closed at RM1.39, with 236.16 million shares traded hands. It was also the most actively traded stock on Friday. IGB REIT Management is the manager of IGB REIT, which is a unit of property firm IGB Corp. IGB REIT owns two shopping malls in Kuala Lumpur, namely the Mid Valley Megamall and the Gardens Mall. Both properties have over 2.5 million sq feet of net lettable area with over 650 tenants and almost fully occupied. The proposed Mid Valley City-type Southkey Megamall project is a joint venture between IGB Corp Bhd and Selia Pantai Sdn Bhd and has a tentative gross development value of RM6bil. Barragry said he was optimistic about the development prospects of Johor. Meanwhile, when asked to comment about a recent report that IGB REIT was looking for inorganic expansion opportunities such as acquisitions in the United States or Europe, IGB REIT Management chief financial officer Chai Lai Sim said the decision to expand overseas was up to IGB Corp.
She also noted that IGB REIT had a gearing ration of 25.8%, which was in line with the industry average. On IGB REIT's local expansion strategy, Barragry said: “We keep our eyes open and the (Malaysian) market is quite lively. 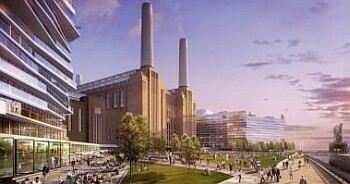 An artist’s impression of the Battersea Power Station with a 6-acre public park facing the River Thames. SEPT 5 a cocktail party is in progress in a tent at the Battersea Power Station to introduce the new owners of the site. Right after Minister in the Prime Minister's Department Datuk Seri Idris Jala and London mayor Boris Johnson complete their speeches, a man goes up to the London mayor. Both him and his wife are informally dressed, and they stand out among the guests who are formally attired. His wife stands a little distance away. He tells the mayor: “We have attended such parties three to four times. Nothing happens after the party is over. Can you please promise us, assure us, that this time something will happen? We have been living here more than 35 years and we want this place to be developed,” the man says. During the last three years, over 300 presentations and meetings with the local community groups and community forum were held. Several past owners have tried to develop the 39-acre iconic site. The last one to try to do so was Real Estate Opportunities but the Irish developer became a victim of the global financial crisis. Battersea Power Station comes under the Wandsworth local council. If there is such a thing as being located at the wrong side of the bridge, this must be it. Because across the Chelsea Bridge, a mere 15-20 minute walk away, is one of London's most sought after address both in terms of retail and residential Sloan Square and Chelsea. Here, the people look different, the air smells different. But there are two huge plus factors over at the Battersea site. One is the 200-acre Battersea Park. The other is the power station itself, one was built in the 1930s and the adjoining one in the 1950s. Both became non-operational in 1983. Since 1985, for 27 years, one developer after another tried to redevelop the site. “It would have been great if the Irish had pulled it off,” says Savills London director Edward Lewis. Says SP Setia Bhd president and chief executive officer Tan Sri Liew Kee Sin: “This is not just a Sime Darby, SP Setia and EPF (Employees Provident Fund) project. It is a government-to-government project. “Despite all the negativity, we have done it! We own it!” And he challenged the press to take that 20-minute walk to the Victoria underground and the Sloan Square underground. For over a year, Liew has been trying to get his hands on the site. He sees the value in it because the site already has the planning consent, which is the equivalent of a development order. He also likes the power station, which will give the development its character and heritage, and is not overwhelmed by the challenges it represent. Italian Rafael Vinoly did the master plan for the previous owner and the consortium is happy with his work. “Here, the layout approval is detailed right down to how the sunlight is going to fall, the type of glass to be used,” says Liew. The consortium proposes to regenerate and restore the iconic power station, build 3,400 new homes and 1.73 million sq ft (160,933 sq m) office space, more than 550,000 sq ft (51,349 sq m) of shops and 160,000 sq ft (14,975 sq m) of food and beverage outlets. The site will also have two hotels offering more than 400 rooms and community space for culture and leisure. It will also have a range of new community facilities. Between now and the next 12 months, there will be much preparatory work on the site. Phase one is expected to begin in the third quarter of next year and scheduled to be completed in 2017. Phase two will begin in the last quarter of next year to be completed in 2019. Phase one comprises conserving and preserving the power station and the development of 800 units of apartments with a preview tentative scheduled for November this year and a soft launch early next year. The one and two-bedroom units are estimated to cost a minimum of £900 per sq ft.
Work on the riverside walkway to connect to Sloan Square and Chelsea will also commence in phase one. DESPITE the location and proximity to Chelsea and Sloan Square and the 200-acre Battersea Park, and the fact that the planning consent is already there, there are challenges to the Battersea Power Station site, say property consultants. Savills and BNP Paribas Real Estate in London both say the fundamental challenge is the power station, which cannot be knocked down because it is listed as a heritage site. Says Savills director Edward Lewis: “Millions of pounds will have to be spend to keep the power station and its four towers standing; this is only part of the upfront costs. It is not as simple as paying £400mil and construction begins on a clean slate. Savills first advised previous owners of the site in 1986. Lewis says while there is a shortage of housing in London, both private and affordable, on this side, nothing has happened for a very long time. Around the power station site, “there are only industrial sites which nobody cares about,” says Lewis. This is ironic because Chelsea is located on the other side of the Thames, just across Chelsea Bridge or Albert Bridge. It is 3.3km from the power station to the centre of Chelsea on Kings Road. The main contention for this lack of activity on the southern side of the Thames is lack of public transport, which the consortium will help to fund. The funding for the conservation and public transport are lumped together as upfront costs, which the consortium has to bear before construction of residential and commercial units can commence. On a count of one to six, with one being very poor and six being very good, BNP Paribas Real Estate senior director for development and residential Dr Anthony Lee gives it a score of three despite it being so centrally located. In order to build a high-density development, there is a need for a score of five to six, he says. Says Lee: “The power station development itself is particularly reliant upon the extension of the Underground rail system from Charing Cross, through Vauxhall, Nine Elms and terminating at the power station. “Without this extension, the commercial success ... is in doubt,” he says. He says due to central government spending constraints, the developments within the Vauxhall Nine Elms Battersea area have to fund a significant proportion of the costs. The Malaysian consortium will be contributing £203mil to the NLE, and further contributions to other infrastructure and services from a total pot of £25mil. These include interim bus services, community facilities, off-site CCTV, improvement to other public transport, bicycle-for-hire scheme and other parking zone contributions. Conservation of the power station will require a further investment of between £50mil and £60mil. S P Setia Bhd chief executive officer Tan Sri Liew Kee Sin does not seem perturbed by this huge contribution to be made. He says the single lifeline to the site is the Underground, a fact he acknowledges and is aware of from the beginning. “The Northern Line extension will add value to the site. It will help to create a brand new community and will make Battersea Power Station site a new destination. “The £203mil contribution to build the NLE does not need to be handed in upfront. It is paid on a staggered basis as the project progresses,” he says. He adds that this strategy, where the developer whose project benefits from the line contributes to the funding of the line, is something that Malaysia can learn from. “The Klang Valley is also building the MRT (MyRapid Transit). We should learn something from this,” he says. It is believed that the two parties who will be making the most significant contribution to the NLE is the Malaysian consortium and the US government. The United States will be relocating its embassy to the southern side of the Thames, near the Battersea Power Station site. “We are not the only one making that contribution. Other developers will also be contributing,” says Liew, adding that the contribution is determined by the land size. Another challenge to the site is competition from other developments in the Vauxhall Nine Elms Battersea area. Lee says there will be at least 16,000 residential units in the area, with about 3,000 of them at the power station site. This places a significant burden on the developers in the area. Some of the developers which currently have projects there include Ballymore, which is building Embassy Gardens; and Berkeley Homes which is known for its riverfront developments, including St George Wharf that is already completed, and which recently launched Riverlight that is being retailed at about £1,000 per sq ft.
“There will be challenges for all the developers involved in releasing new stock into the market in an orderly fashion to maintain sufficiently high sales values,” he says. “A high proportion of the Battersea Power Station scheme includes offices and retail. This is a new and untested location for Grade A offices and there will be competition from other new office locations, such as Kings Cross and Stratford City. Both these areas already have excellent transport links in place (and will be even better after the NLE to Battersea Power Station is completed) and Stratford City has the cache of the Olympic Park. Lee says while Battersea is popular among young and affluent professionals as a place to live, the area immediately surrounding the power station itself (the Vauxhall Nine Elms Battersea Opportunity Area) is very different from the wider Battersea. “Firstly, it is characterised largely by industrial buildings, many of which are under-utilised, with very little residential. The second issue is accessibility to the area by public transport is relatively poor in comparison with other areas in London. “Finally, there is a tension between funding the Underground Extension and ensuring that developments in the area provide enough affordable housing and funding for community infrastructure so that communities are sustainable,” says Lee. To this, the consortium proposes to deliver over 500 affordable housing units across the site, split between social rented and intermediate tenures. This reflects the maximum reasonable level of affordable housing that can be offered, considering the availability of public subsidy, the costs associated with the restoration of the power station and other contributions, most notably the significant contribution to the NLE. On these various upfront costs and the conservation funding, Lee considers this as an investment, not a cost. “(The power station) will be the heart of the entire project and the Underground extension its lifeline,” he says. Next Wednesday, Fitzroy Place, London W1, will be launched in Britain, with apartment units advertised as £750,000 to over £12.5mil. That same project was promoted in Hong Kong, Singapore and Malaysia four months ago. The fact that it was first launched in the Asia is very telling. As the global financial crisis continues to unravel in the West, there is the perception that Asia is flush with cash. During a recent visit to the site, Savills' Hannah Smith says over 100 apartments have been sold with contracts exchanged, with a value of over £150mil. The units were priced at an average of over £1,700 per sq ft and up to over £2,850 per sq ft.
Smith says buyer profiles are a complete mix with multiple nationalities and include owner-occupiers, investors and empty nesters. Singapore and Hong Kong buyers are equally divided and form a large number of Asian buyers, while there are equal numbers of Malaysians and Thais who have bought into the project. When it was marketed in Kuala Lumpur, it was said to be one of the most expensive project to come by our way. Unlike Kuala Lumpur, where properties can be simply divided as high-end, medium-end and affordable housing, the London residential property market, in terms of pricing, has many more tiers. Says Richard Thomas, chief executive officer of Gatehouse Bank: “London has a complex residential market. There are many tiers and categories which cater to a wide range of investors. There are the 25-bedroom houses which are sold for £300mil. In this category, investors can pay anything. It is what I would call an unreal category and does not provide the real flavour of the residential market. “Then there is the high-end serviced apartments like 1 Hyde Park at £7,000 per sq ft. The prices of properties in London have moved beyond the reach of many to the extent that today, many who work in London are living in other cities and commute one to two hours to work. As more people from around the world descend on London, the demand for housing continues to grow. 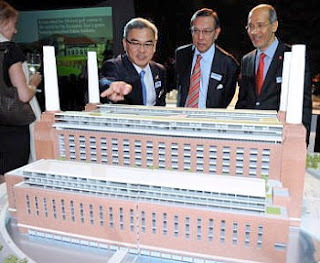 It is this demand for housing, both to live and to rent, and the need for the creation of new destinations that saw SP Setia Bhd, Sime Darby Bhd and the Employees Provident Fund (EPF) launching out together to create a new destination at the Battersea Power Station site. Although centrally located with a nearby 200-acre park, the area has been left derelict for years due to unfavourable public transport connectivity. He says the timeline for the development is clearly laid out. EPF chief executive officer Tan Sri Azlan Zainol says the attraction of the financial hub of London will continue to draw investors into the city's property sector. BNP Paribas Real Estate senior director Andrew Cruickshank says as the European economy continues to face unprecedented challenges and the Middle East remains unsettled, London will continue to retain its position as a safe haven for overseas money. “During 2011 and the first half of 2012, 60% of buyers in the prime central London market were from overseas,” he says, with overseas investment for the London residential market coming primarily from China, Hong Kong, Singapore and Malaysia. It was this interest which prompted new developments to be usually first marketed in either Hong Kong or Singapore before being released to the UK market. Other investors are from Russia, Ukraine, India, Europe and the Middle East, Cruickshank says. While European and Middle Eastern investors prefer period-built stock in more central locations, Asians usually prefer new off-plan purchases. European buyers are predominantly from France, Italy, Ireland and Germany and the Middle Eastern from the United Arab Emirates and Saudi Arabia. The number of Middle Eastern investors, especially Egyptians and Libyans, is increasing in central London. UK-based investors are coming back into the market and comprise mainly investment funds and institutional investors. Cruickshank says the shortage of housing within the city has resulted in developers converting office developments into residential properties. “They are also replanning consented office developments for residential. Westminster council is particularity supportive of office conversions. “London boroughs are intent on selling surplus land and buildings, making them the biggest supplier of land in London,” he says. He says the prices of residentials in prime central London increased by 10% in the 12 months to June this year while the average London residential rents increased by 4% in the same period. KUALA LUMPUR: The Construction Industry Development Board (CIDB), the country's construction industry watchdog, has proposed that the government require all construction projects, worth RM100 million and above, use Industrialised Building System (IBS). In a statement yesterday, the board's chief executive Datuk Seri Dr Judin Abd Karim said the requirement to use IBS, especially prefabricated walls, will contribute towards enhancing the productivity of the construction industry, and reducing dependence on unskilled foreign labour. "The utilisation of IBS by the private sector is of paramount importance as the sector holds more than 60 per cent of the total construction project value. "About 90 per cent of residential projects such as flats, condomi-niums and terrace houses are built by the private sector. "These projects have high IBS adoption potential because of its repetitive nature," he said. Judin made the recommenda-tion when launching the IBS and Mechanisation Seminar 2012 recently. Judin said when the first construction industry roadmap was introduced by CIDB in 2003, the take up rate of IBS in the construction sector was merely 15 per cent. The government recognised that as a large single buyer it can influence and dictate the method of construction. The government issued a treasury circular in 2008 that mandated all government projects attain no less than 70 per cent IBS content for public-sector projects. With the public sector now on the IBS track, the next opportunity and challenge is to convince private-sector project owners to increase the usage of IBS. CIDB is now in the second IBS roadmap from 2011-2015. More rigorous efforts are being put to ensure that by the end of 2015, the take-up rate of IBS in the construction industry by the private sector will increase to 50 per cent from the current 30 per cent. The promotion of IBS and mechanisation of the construction industry has been among the core initiatives of CIDB to increase productivity, efficiency and effectiveness of the industry. IBS implementation also ensures a safer work environment at construction sites and produce minimum amount of wastage when compared with traditional construction methods.